From Kate: It was my intention to hold a giveaway at the beginning of the school year this August. Thankfully as life always does, it gets busy with great things. Getty started 3rd grade this year and to say we are over the moon excited for her and all of the adventures she is sure to experience, would be an understatement. We hope everyone has also had a great start to their new school year. Time is flying by and it is so crazy to realize we are almost into the month of November. Where does the time go? This giveaway focuses on elementary school age SMA kiddos. In year’s past we have found some great products that help support SMA kids access their learning just a little bit easier. Technology, adaptive scissors, easy glide crayons, and many more products that hopefully, will offer some support for their academic success. Giving Thanks Giveaway Bags to 4 awesome SMA kiddos! What’s in the Bag? iPad Otterbox iPad case $50 Apple Gift Card Getty Owl Foundation Tote Bag Crayola Twistables Crayons Crayola Twistables Color Pencils Dry Erase Markers Crayola Slick Stix Crayola Markers Dry Erase Board w/eraser Adaptive Scissors Glue Sticks Pencil Sharpener Watercolors Tape DETAILS: –Entries begin today, October 28th and end on November 2nd at 4pm PST. 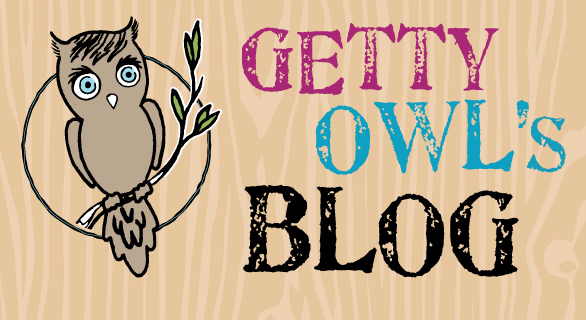 -Entries send to hoot@gettyowl.org Please add the following information to your entry: -Name -Your SMA Child’s Age & Grade Level -Address & Phone # -Attach a picture -Only one entry per child allowed. -4 SMA kids will be chosen in a random fashion based on number chosen from random.org. -The 4 SMA kid recipients will be announced and celebrated on Saturday, November 3rd at 12noon PST. HUGE THANKS DUTCH BROS. COFFEE! 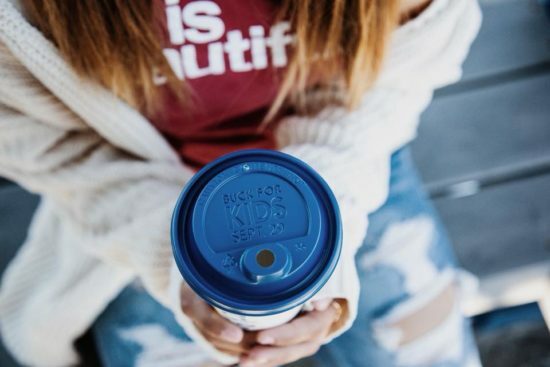 From Kate: We cannot control our excited in hearing the amazing news of how successful Bucks for Kids was on Sept. 29th at area Dutch Bros. Coffee. In order for this exeunt to be successful, we start at the top. Thank you to the Grubbs family and your incredible staff. 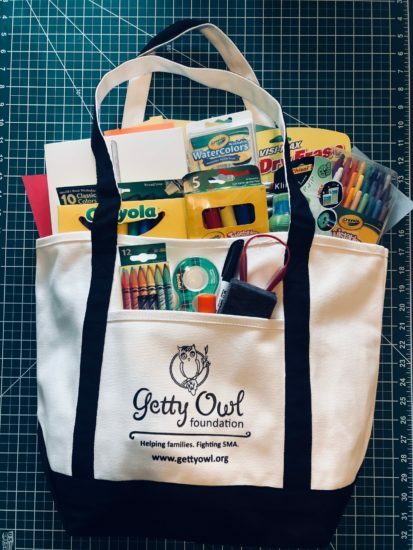 Every single year you have been kind enough to choose Getty Owl Foundation, we are always so appreciative of your gracious offer. The day is always a celebration and it starts from you as a family. thank you so very much for keeping Getty in your hearts and understanding how SMA affects so many families. Thank you for giving us a chance to continue to support those in need. Love you guys! I hope everyone in the area understands how Dutch Bros. Coffee affects people all around the region. Yes, they sell awesome drinks, but thankfully they also offer a commitment to their community. They see a need and they act with such generosity. Thank you Dutch Bros. Coffee, the Grubbs family, the incredibly awesome staff, your customers that makes all of this possible. You ALL helped to make Bucks for Kids an absolute success! Join us tomorrow (Saturday, September 29th) @ Dutch Bros. Coffee: BUCKS FOR KIDS! From Kate: We are so fortunate enough and thankful to have been chosen again for Dutch Bros. Coffee’s, Bucks for Kids. 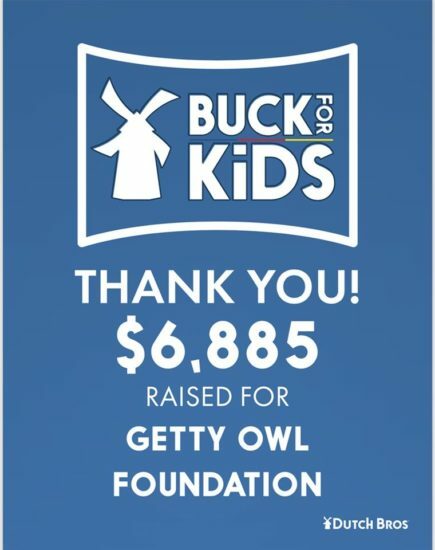 This amazing annual fundraising event is something that we here at Getty Owl Foundation, depend upon. 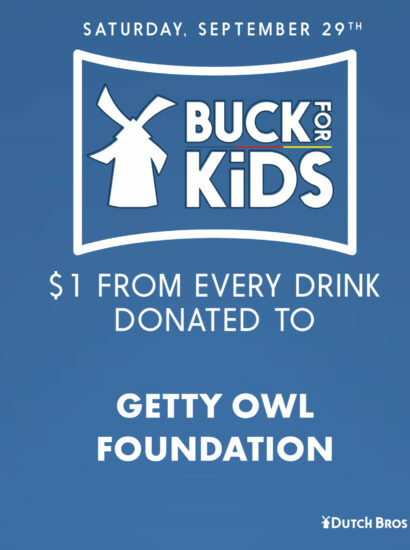 Because of the amazing support from Dutch Bros. Coffee, Getty Owl Foundation is able to continue to purchase medical supplies, life saving medical devices, and iPads for SMA kiddos to help bridge the gap with communication and academic needs. 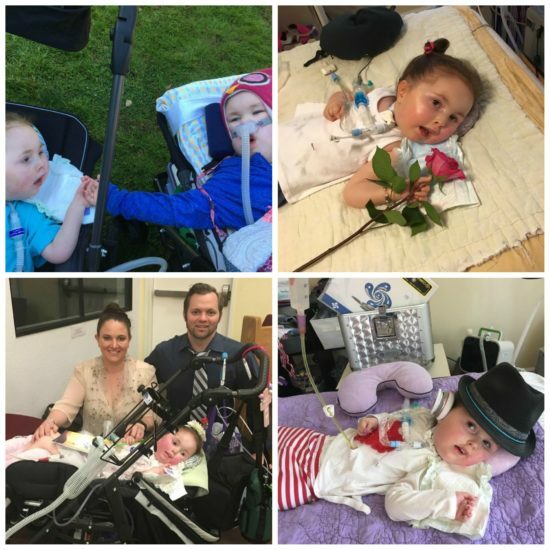 For a 100% volunteer nonprofit, every single donation is important and is used in a way that best helps the SMA community. Gaining the funds and having the autonomy to support SMA families in such custom ways has truly been a beautiful experience. Thank you so very much Dutch Bros. Coffee!!!!!!!!!!!!!!!!!!!!!! We hope everyone in the Sacramento area can stop by one or all the following locations and helps support Getty Owl Foundation this Saturday, September 29th. We thank you all in advance for your support and we hope you enjoy a great espresso drink………because they are ALL amazing! The fundraiser is all day and night. Stop by and grab a drink or drinks from any of the below locations. Citrus Heights, Fair Oaks, Sacramento Locations: 8552 Madison Ave. 7445 Madison Ave. 5289 Auburn Blvd. 4625 Manzanita Blvd. From Kate, The game changed on this day, last year. A blanket of emptiness, a fog of disorientation, and an overwhelming feeling of loss was plentiful and overwhelming. Reagan departed from her physical existence on this day. Shannon and Randy, her incredible parents were now without her and there was just nothing fair about it. It was unkind, it was unjust. A saving grace was that their family and friends came with such immediacy, it was a beautiful offering of love and comfort that must have brought them such reassurance. If you have ever met Shannon and Randy, you would know that even with a diagnosis so grim, there was never space or energy to acknowledge the possibility of losing Reagan. They always focused on the present, the now, and the tangible. They also welcomed family and friends to meet Reagan and each were welcomed with her special spirit and she was brought into their homes and hearts. We got to witness dance parties, milestones, outings, birthdays, hugs, kisses, and life. Their ability to see through any adversity and still focus on the good and the optimistic, offered such positivity into the world and it was infectious. Because of their selfless offerings, the world got to meet Reagan. This larger than life human being. A true spitfire that could flirt with you with just a slight wink of an eye. She could hypnotize anyone with the slightest of ease. Reagan had the power to just make you want to do better. Be a better friend, be a better contributor for your community, just be better, whatever that meant to you. All kinds of people come into your life and if you sit still long enough, you can feel a presence of energy from certain people. You can call it what you wish, but I like to think that while there is good in all of us, some people have the ability to use their presence to create change. Reagan did that with such ease and grace. While we can’t begin to know what Shannon and Randy are feeling and thinking on this day or any day for that matter, you can be certain and comforted knowing that they would want everyone to take a moment today to remember this incredible human being. Remembering the sweet coos, the eye rolls, the smiles, the determination, and the unconditional love, Reagan offered to everyone. We miss you Reagan. We miss you so very much. Please continue to make yourself known by a beautiful sunrise, a gentle breeze, or in my case, a spunky little hummingbird that sneaks up on me while watering the plants. It perches just long enough to be noticed and then it is gone as fast as it was there. I say thank you and I love you every time it makes it presence known. Shannon and Randy, you hearts are so vast and welcoming. You continue to contribute to your community in ways that inspire people to do better and to do more. Thank you for your selfless offering of Reagan. Thank you for sharing her with so many. Thank you for allowing so many to see into your world of life and love. Today like everyday, we honor sweet Reagan. Love you guys!